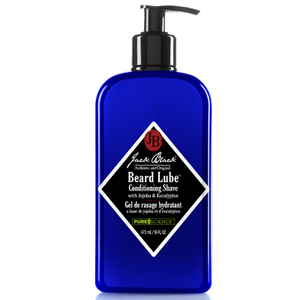 Award-winning Beard Lube from Jack Black, a brand who create products that you can trust to perform and work as hard as you do. The versatile lube is a three-in-one pre-shave oil, shaving cream and facial skin treatment with a clear formula for a precise, closer shave. Enriched with phospholipids, rich in fatty acids to lock in moisture and support the skin's natural barrier, whilst a blend of peppermint, eucalyptus and menthol refresh skin. Macadamia nut and jojoba oils form a protective cushion to allow effortless gliding of the razor, preventing nicks and burns without clogging the blade. E.N. The PureScience® formula uses certified organic ingredients with no parabens, fragrance or colourants. Dermatologist tested. Work a quarter-sized amount into your slightly moist beard every time you shave in the shower, or immediately after showering. Beard Lube® has built-in moisture, so you don't need a lot of water. For areas with heavier, coarser whiskers, allow product to remain on skin for 60 seconds before shaving. Glide razor over face. Rinse with warm water. Water (Aqua), Cetearyl Alcohol, Macadamia Ternifolia Seed Oil, Behentrimonium Methosulfate, Simmondsia Chinensis (Jojoba) Seed Oil, Hydrogenated Lecithin, Glycerin*, Mentha Piperita (Peppermint) Oil*, Menthol, Eucalyptus Globulus Leaf Oil*, Dimethicone, Phenyl Trimethicone, Calluna Vulgaris (Heather) Extract, Lecithin, Dimethiconol, Cyclopentasiloxane, Caprylyl Glycol, Caprylhydroxamic Acid *Certified Organic. 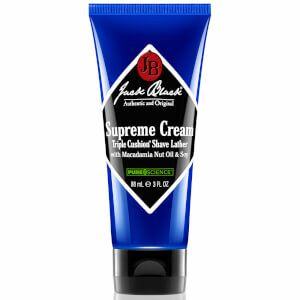 i love this stuff it smells nice and shaving without it is no where near as smooth. you only need a tiny amount and i would recommend to everyone. This thing is amazing. I always thought that this kind of thing would be a fad. Oh well....it's not and it's awesome. Great product, helps me shave really well and feeds the skin in the process. Wish I could shave more often. :-) Definitely worth the money.